American impressionist Harold Rotenberg spent many summers in Rockport. With a hand he believed was guided by God, Harold Rotenberg painted canvases that gave new life to the spectrum of colors he admired in landscapes around the world. 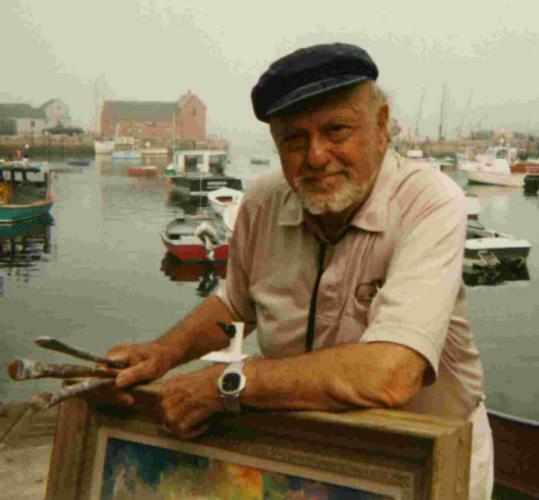 From the rocky coast of Quebec to a hillside village in Israel to a cove in Rockport, where he spent many summers, Mr. Rotenberg painted scenes that formed a visual diary of international journeys that continued even after he turned 100. The subtlety of light, and its absence, spoke to him. Mr. Rotenberg, an American impressionist whose work is part of the collections at the Museum of Fine Arts in Boston and the Israeli Parliament building, died in his sleep April 2 in his Winter Park, Fla., home. He was 105, and until recently his health was so good that his physician cleared him to travel once more to Israel. Generous with the paint he applied, Mr. Rotenberg created canvases that provided an aesthetic experience as tactile as it was visual. Never one to linger in his studio, Mr. Rotenberg traveled the world looking for subjects. He considered his paintings adventures and thought that standing in front of a scene as he committed it to canvas was an integral part of creativity. He also needed to feel the presence of the divine. “The most amazing thing about my father was that he had such great faith in God,’’ said his son, Jon of Brookline. Born in Attleboro, Mr. Rotenberg was the youngest of eight children. His father was a tailor, an artist with cloth, Mr. Rotenberg told interviewers. Mr. Rotenberg tried his hand at painting after seeing an older brother create sculptures from female figure models, an appealing art subject for an adolescent boy. At 19, not long after graduating from high school in Attleboro, he traveled to the Middle East and Europe for months with his parents and studied art in Jerusalem. Over the next dozen years, he also trained in Boston, Paris, and Austria, and in the decades that followed he returned often to Paris and spent months at a time in Israel. He studied at the Museum School in Boston, at the Académie Julian and the Académie de la Grand Chaumière in Paris, and the Kunst academy in Austria. He also taught in Boston at the Museum School and the School of Practical Arts, and in settlement houses that helped immigrants adjust to life in this country, such as Hecht House in Dorchester. As much as possible, though, he supported his family by painting and indulging his wanderlust, traveling to Mexico and Morocco, Japan and Europe. Everywhere he went, Mr. Rotenberg sought creative sustenance outside in the elements, sunshine or storm. The experience, he said, was always spiritual. Mr. Rotenberg’s first marriage, to Fay Amgott, ended in divorce. She became his companion on his travels, too, and got to see up close the joy he felt, brush in hand. “When he paints, he smiles,’’ she said in the video. His daughter Judi Rotenberg Ross Zuker of Newton, who used to sell her father’s paintings at a Newbury Street gallery she formerly owned, said his enthusiasm for a life that had stretched for so many years seemed to almost overshadow his artistic accomplishments at times. In addition to his wife, son, daughter, and granddaughter, Mr. Rotenberg leaves another daughter, Jane R. Moss of Boston; two stepdaughters, Audrey Lentz of Winter Park, Fla., and Janis Bear of New York City; four other grandchildren; four stepgrandchildren; three great-grandchildren; and three step-great-grandchildren. A service has been held for Mr. Rotenberg, who was buried in Agudas Achim Cemetery in Attleboro. Mr. Rotenberg never took for granted the blessing of longevity.